Ever heard of a smartphone made with Liquidmetal construction? It's the flagship-grade Doogee F5! Check out the rest of its guns here! The smartphone industry is a highly saturated market that features products updated in a very high frequency. Of course, we have a list of the popular brands and what they have in store for their followers this year; however, there are few minorities in the Android space that could fair better with the current offerings of these top brands. The Doogee F5 is one of these. 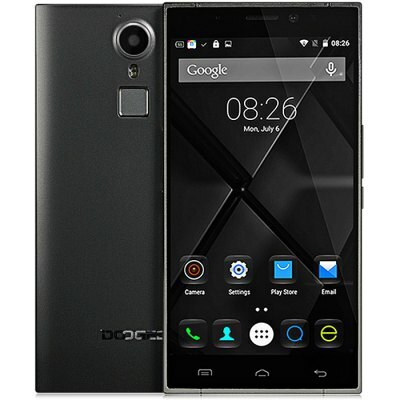 In fact, Doogee F5 edges the closest competition in terms of design and construction. This is due to the fact that it is one of the handsets that uses a Liquidmetal material in its construction. For the uninitiated, the Liquidmetal is an amorphous metal alloy which is heated to make it act like gas in suggested environmental conditions. This, in turn, makes the material easy to be moulded during the casting process. Liquidmetal is said to be stronger than aluminum or titanium after being processed. Technically, the handset's design is new to our eyes. It comes with a metal frame and a curved back to make it easily nestle in the hands. Aside from the metallic finish, the Doogee F5 also boasts several premium-grade specifications that shade most of this year's top of the line handsets. For one, it comes with a 5.5-inch full HD panel which packs 1920 x 1080 pixels. The Gorilla Glass 3-treated display frames 401 ppi pixel density which could definitely give crisp and vibrant pictures. Under the hood, the handset harnesses its computing power from the MediaTek MT6753 chipset which features a 64-bit 1.5GHz octa-core processor and Mali T720 GPU. The 3GB of RAM will also work alongside the chipset for faster app launching, web browsing and multitasking activities. As far as the camera goes, the Doogee F5 includes a 13-megapixel Samsung sensor for the rear camera and 5-megapixel for the selfie camera. It is also worth noting that the device packs a fingerprint sensor on the rear panel. It has 360-degree fingerprint identification which could be used in unlocking the device and other nifty security features. The Doogee F5 boots with Android 5.1 Lollipop on the fly and includes a 3000 mAh battery. Plus there's also a complete set of radio including 4G LTE, WCDMA and 2G Edge connectivity to name a few. Where to buy Doogee F5 if you’re in the Philippines? You can get the Doogee F5 in a very practical pre-sale price standpoint of USD 139.00 in GearBest. They offer free international shipping in several countries including the Philippines.